I’m asked fairly regularly by female readers about starting a version of Permanent Style for women, but in my experience there just isn’t enough out there of interest – that’s well-made, classically styled and not too middle-aged. They also ask if I know of any good sites – so if you do, please let me know in the comments to this post. Several of the bespoke tailors do make clothes for women, but they are mostly women’s versions of male styles, with the same proportions and priorities. 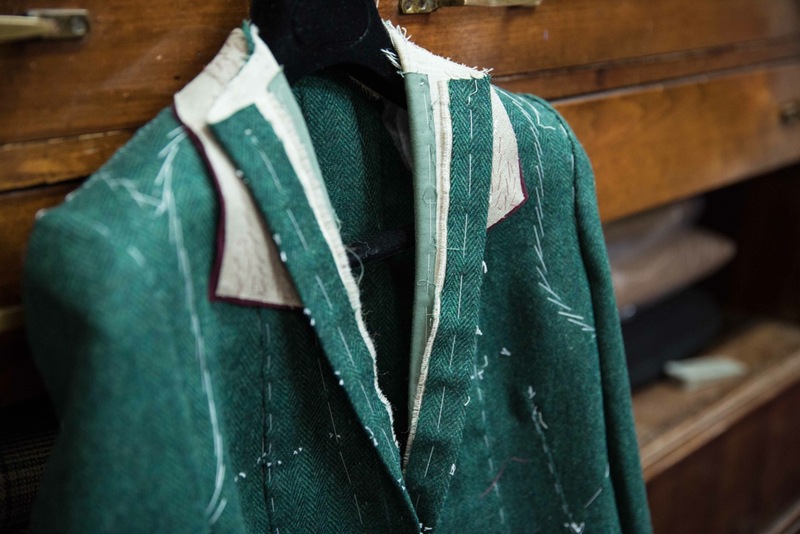 Then there are tailors such as Edward Sexton, who make fabulous creations but generally to their own, refined aesthetic. 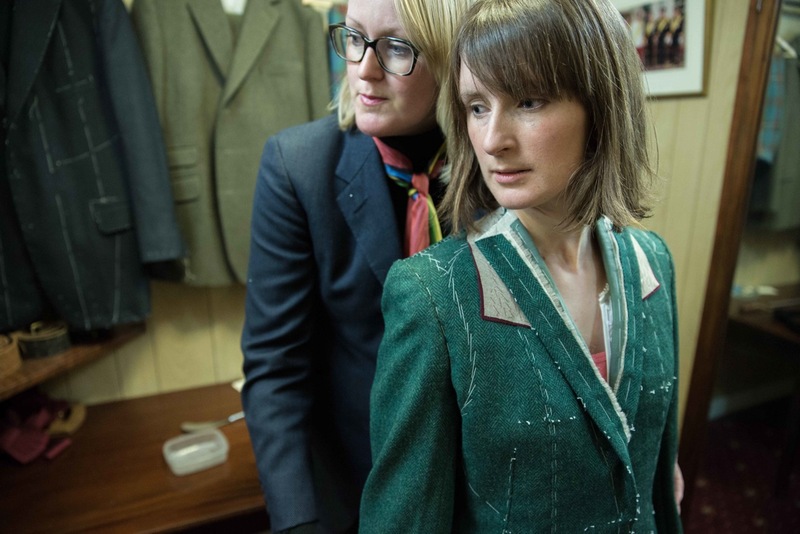 Kathryn Sargent, who made me my fantastic travel blazer while she was at Gieves & Hawkes, has quietly been making suits for high-powered female clients for quite a while. Perhaps they were attracted by Kathryn being the first-ever female head cutter on the Row, but they seem also to have become regulars. 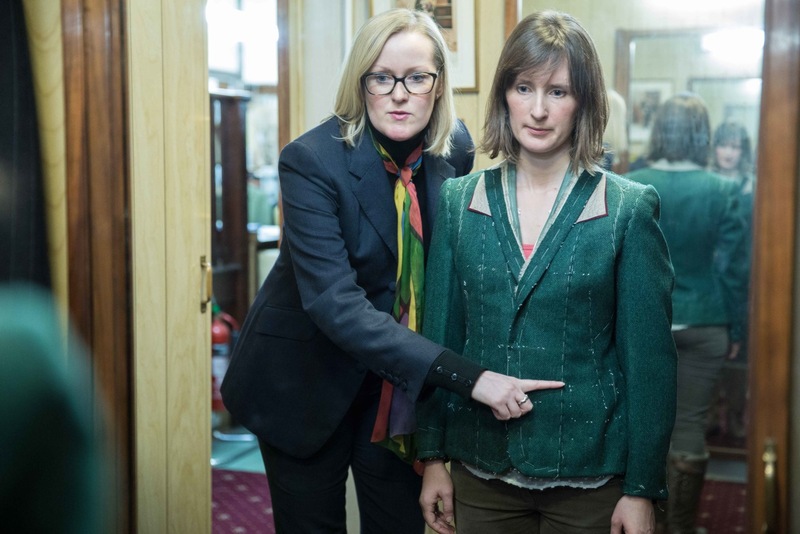 I was interested in exploring the differences in women’s tailoring, therefore, when my wife decided to have a bespoke jacket made by Kathryn. The images here are from the first fitting. As my wife rarely needs to or opts to dress smartly, we needed to make something that would be fairly casual, yet perhaps could be dressed up with grey flannels if so desired. We went therefore for a green herringbone tweed from the Sherrytweed bunch – the same from which Steven Hitchcock made me a jacket last year. Kathryn’s tailoring for women is very flexible and adapted to the individual. There are far less presumptions than with male tailoring. A business suit for a female director might therefore more closely mirror the proportions of male colleagues, but a casual jacket like this one, for a relatively young client, is often more contemporary. She has her own book of sketched designs to illustrate the various options. Most noticeable is that the length is much shorter than a classic male suit. It tends to be with women anyway, partially because the waist is that much higher, but it is also necessary to make slightly greater concessions to fashion. The back of the jacket at this fitting was also slightly shorter than the front, so the effect is exaggerated; it will be lengthened. Kathryn’s branding is in burgundy, and she uses this for the melton under the collars as standard. 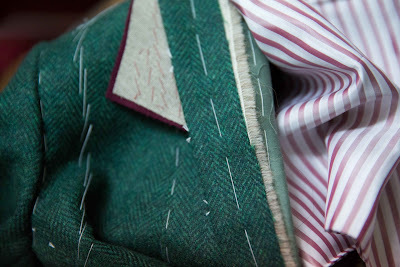 We picked a Liberty shirting for the lining of the body that echoes the green of the cloth and that deep red. The sleeve lining is a red butcher’s stripe. 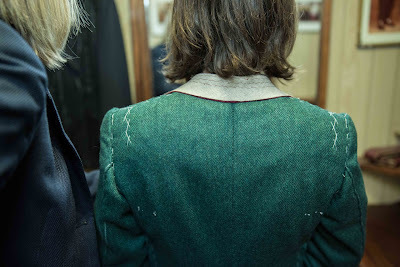 You can follow the discussion on Women’s tailoring at Kathryn Sargent by entering your email address in the box below. You will then receive an email every time a new comment is added. These will also contain a link to a page where you can stop the alerts, and remove all of your related data from the site. Great post and that jacket looks very flattering. 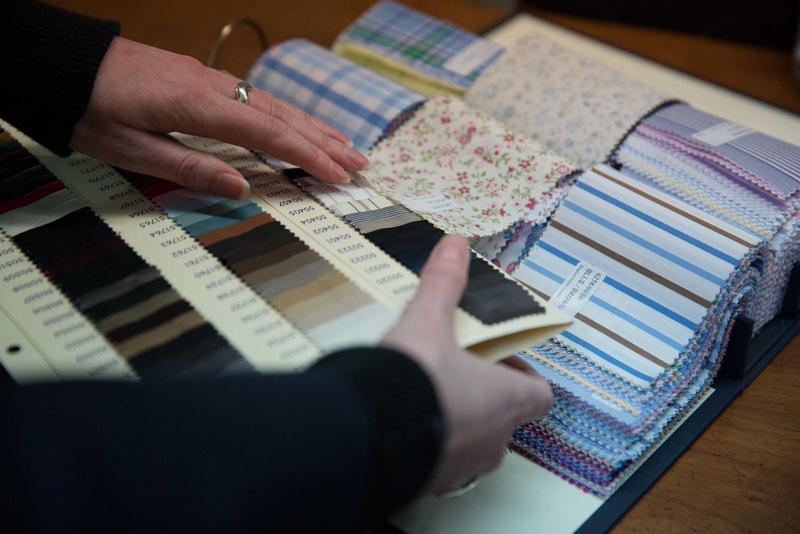 Does G&H bespoke have a house style? Is it similar to Huntsman? As a result of their mass-consumption RTW range, their bespoke is not as widely talked about on blogs despite having the highest Row share. G&H doesn’t, no, but that’s something new cutter Davide Taub has been working on. The new cuts looks beautiful – Davide is a real innovator and fantastically talented. Generally it’s traditional English military, but not as pronounced as Huntsman. More like Poole. Have a look at the Rake piece I link to on my travel blazer to get an idea. And G&H doesn’t have the largest share of revenue on the Row. It’s Henry Poole or A&S, depending on whether you count the latter as being on the Row. They do have a very large department though, and you’re right in saying this doesn’t get talked about much. Hmmm…the sleeves don’t look too good in all honesty. Am I correct to assume this will be fixed later on? If you’re referring to the pitch, then yes this will be changed a lot. It’s only a basted fitting. You should take her out more often then! 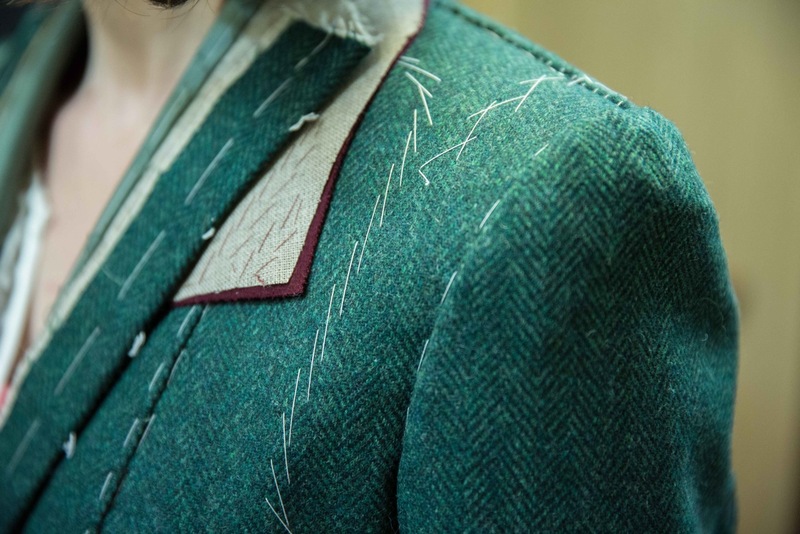 I would love to go through the process of having a jacket made! or better still to be a student of Kathryns. Thank-you so much for the post. You asked up post for Ladies Tailors; may I put forward myself? I’m Katherine Maylin, I am exclusively a Ladies Tailor. 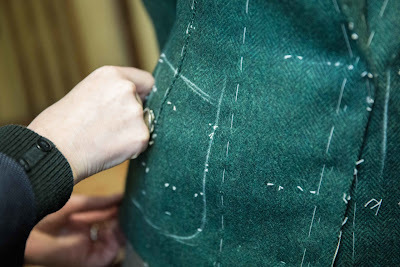 I trained over 30 years ago with Bernard Weatherill and have worked in Savile Row ever since, with the last few years in Katherinemaylin.com. Having been a tailor all my working life, I particularly enjoy the varied work that ladies tailoring provides. Thanks Katherine, nice to hear from you. I like the style sketches on the site. Hi Simon. Ref ladies tailors. I have used Henry Poole’s in the past for my suits, but I was directed by my friend to a really good tailor in Leeds, Des Merrion. Excellent ladies tailor, modern, fitted but more importantly very feminine cut. I switched allegiance from the Row without hesitation. Regards, Sarah. Simon, how has this jacket worn, if I may ask you – or your wife 🙂 Would you recommend the cloth or colour for a sports jacket for men too? You have not linked this to your articles on “green is the 3rd colour”, that is why I am asking. What I like about this colour is that it is not too autumnal, could perhaps be worn in all seasons. And one could pair it with dark blue, light grey and tan/cream trousers, or what is your / your wives experience? Thanks to both of you! PS Link to Steven H. in the article does not work. It has worn very well, thanks. I’d certainly recommend the colour. I am petite – 5’2″ – 7′ 10lbs & primarily need classic smart jackets, skirts & trousers for business. Considering this post was from 2013, have you now come across any female tailors held in a similar regard to Kathryn Sargent? Do you mean female tailors, or tailors for women? Ah. Well not particularly, no. There are some good young cutters at some of the houses, and some superb tailors too, but no one as a head cutter. I live in Australia but I love suiting brand Isadora Nim. They specialise in only women’s tailorjng. I have the most gorgeous white shirt with a mandarin collar – I’ve never owned something that fits so well! I graduated from university last year and presently work in finance in the greater NYC area. I wear a lot of MTM clothes and have recently commissioned my first bespoke garment, with Luigi Solito. My fiance and I have been discussing clothing recently, and I wish I had somewhere to point her for more classic, timeless women’s clothing that isn’t so fashion oriented. Do you have any advice or suggestions? It would be great to see a whole post on the womenswear scene (if it even exists?!). I’m sorry, no I don’t. A few people do ask about this, but the problem is women’s fashions do change pretty quickly, even in pretty basic office clothing for example. And it’s rarely worth a business making really good quality pieces as a result. I could try to do a piece summarising the good men’s artisans that also make for women though.